I have to admit, sometimes we post stuff on Twitter and I forget to follow up right away on our actual webpage. Such was the case when the official website for The Social Network went online. Of interest to you, dear reader, is the background music, which some initially speculated was Nine Inch Nails. What little obfuscation there was in the Flash files was no match for NIN fans, who quickly traced the audio back to an MP3 hosted on Sony Pictures' website, titled "Hand Covers Bruise (no piano)" and credited to Trent Reznor and Atticus Ross. You can listen to a stream at Antiquiet, who give a shout to OneThirtyBPM for Jordan Raup's link, which Mr. Raup first posted first on The Film Stage. In the unlikely event that Sony takes the MP3 down from their site, you can download it from OneThirtyBPM. Thanks to AcolorfulmonstR and Tony B for sending in the news. Yesterday, a package arrived at my doorstep, delivered from Hong Kong. Within it was an unopened, limited edition Shinya Tsukamoto Laserdisc box set from the mid-90s. Considering that I don't know any Japanese, and don't have a laserdisc player, this is kind of a weird thing to have bought. However, the reason I picked it up is because on the fourth disc, Tsukamoto's MTV promo clip, which we only discovered the existence of this year - which has a soundtrack penned by Nine Inch Nails. Yes, I paid an embarrassing price for 50 seconds of video on a Laserdisc, but in a way, you paid for it if you'd ever bought anything from our Goodrock store or our merch page. Anyway, on with the content! I'll be sending the box to our resident archivist, ItsJustDave, so we can extract the video and audio, but in the meantime, I've located the paragraph in the 24 page booklet that came with the box set (boxed set?) which gives some background on the clip. 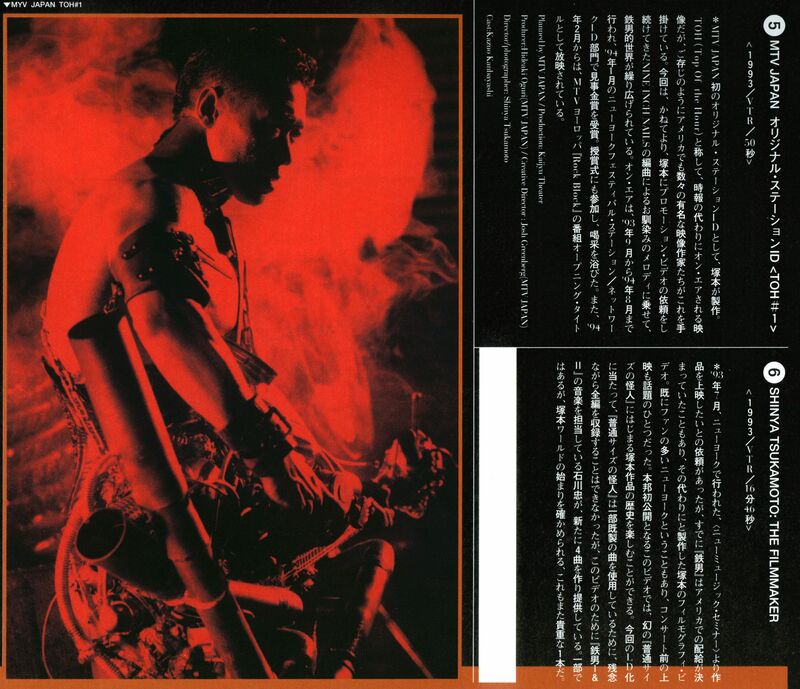 You can read the original Japanese alongside a photo from the shoot in this massive scan I made. I'm not sure when we'll get around to making a high quality rip of the video clip, but keep your eyes peeled here (or follow us on Twitter) and one of these days we'll link you to what we've found. I'm pretty sure its' going to be much higher quality than the clip on Youtube. On account of the Friday kickoff of this year's Lollapalooza, MTV is digging into their vaults and pulling up footage from the festival from years past. Today James Montgomery posted a piece on Nine Inch Nails' first ever Lollapalooza gig, including a low-res video of things taking a turn for the worse right as Sin starts up. A clip from this show has been shown before on MTV, usually tied in with an interview with Trent about how the heat was messing with the equipment, but this may be the first time this much of the footage is being shown. Props to MTV for learning to get out of the way of the music. You can also find two photos of Trent on the '91 Lollapalooza tour at the very beginning of this related photo gallery.